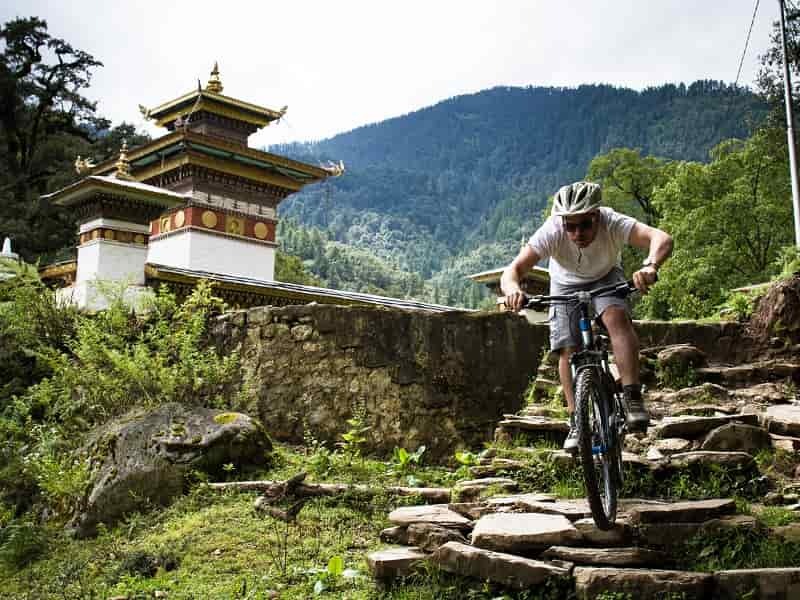 Our Bhutan Cycling Tour will offers you a fascinating adventure which is a mix of cultural tours and day hikes. On this journey, you experience Bhutan like never before, discover Bhutan’s unique culture along with its rich biodiversity. The tour also provides you the opportunity to meet and interact with the local people on the way. Climb to the top of passes and admire the snow-carpeted peaks of the famous Himalayan ranger. Pedal through untouched forests, quaint villages and picturesque valleys of Bhutan. 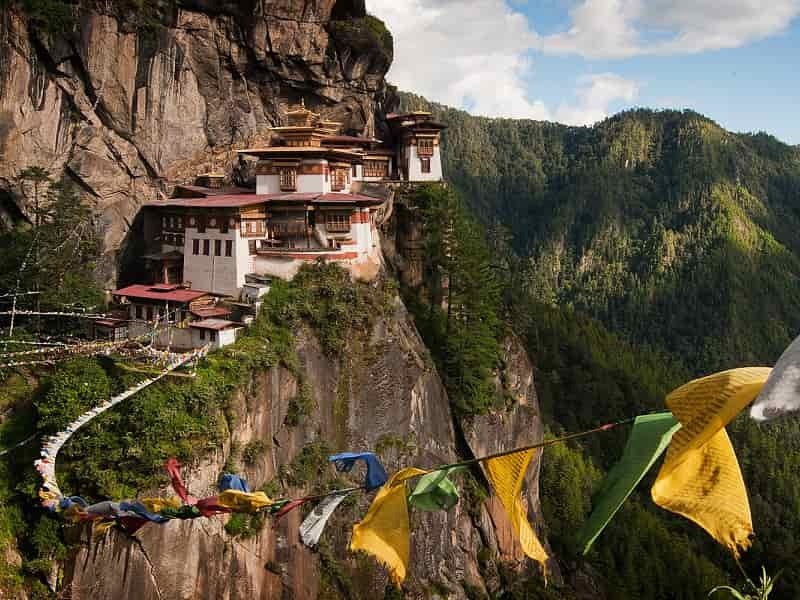 Throughout the journey, you also visit to the kingdom’s imposing dzongs (fortresses) and countless monasteries while also enjoying the diverse Bhutanese landscape. During your flight to Bhutan, if the weather permits, you would experience the world’s most spectacular sights of snow-capped mountains and enjoy the view of the approaching Paro valley with its primeval alpine forest, monasteries, temples and farmhouse. Upon arrival in Paro International Airport, you will be welcomed by our Asia Senses guide in a Bhutanese style with Tashi Khada (white scarf). Then be transferred to your hotel for refreshment and a brief discussion on tour program. After a short break, we start the Bhutan Cycling Tour: A Journey from West to East. 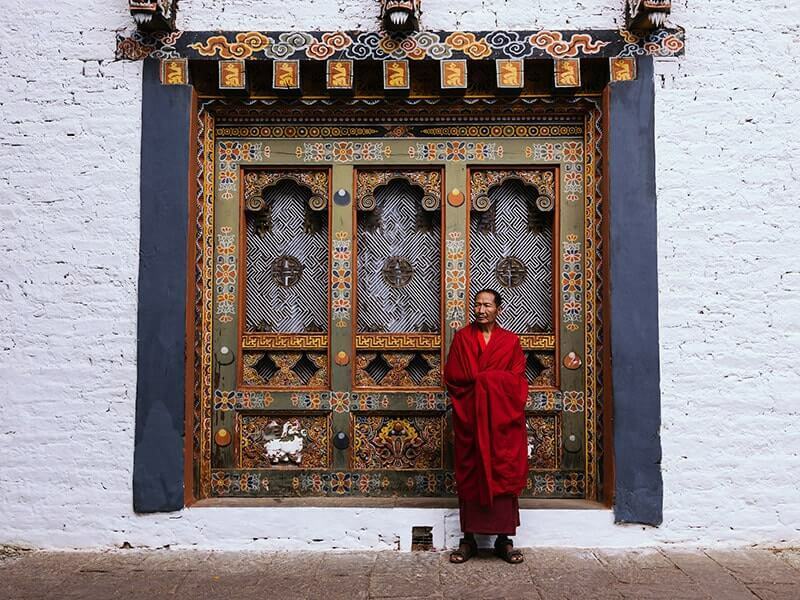 Head out for a test ride on hill streets in the beautiful town of Paro. Begin our first ride with a visit to Ta Dzong which was converted into the National Museum in 1968. 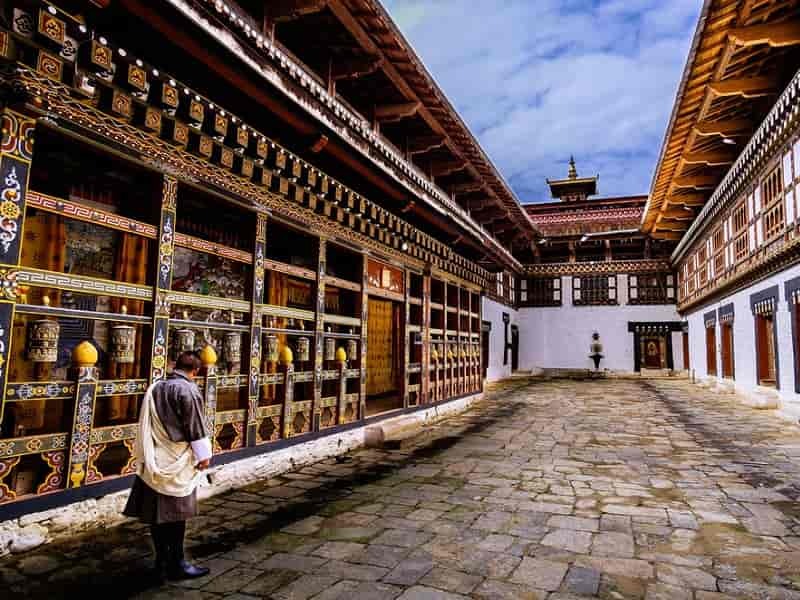 This museum houses many religious relics, works of art and handicrafts offering a great orientation into Bhutan’s historical, cultural, and religious past. Afterwards, continually ride to Rinpung Dzong which is located near to the museum. It was consecrated in 1645 by Shabdrung Nawang Namgyal on the site of smaller fort. Its name means “the fortress of the heap of jewels”. Inside Dzong, see the painting of the great saint Milarepa, considered as the master of meditation by the Bhutanese and believed to have attained enlightenment in a lifetime. Today, this massive fortress is the seat of the district administration as well as the home for the monastic school. From the dzong, walk further down to the beautiful cantilever wooden bridge which provides good view for whole Rinpung Dzong. After that, we will cycle around Paro, observe daily activities of local, see Bhutanese traditional houses. Overnight in one of the carefully-selected hotels in Paro. Our destination today is the Bhutanese capital of Thimphu, which is 51 km from Paro. The condition of the road is good for cycling with few steep climbs or descents. We will ride on Paro – Thimphu Highway while following the Wang Chhu upstream through a mixture of rice fields, coniferous forests and hills dotted with monasteries and chortens. 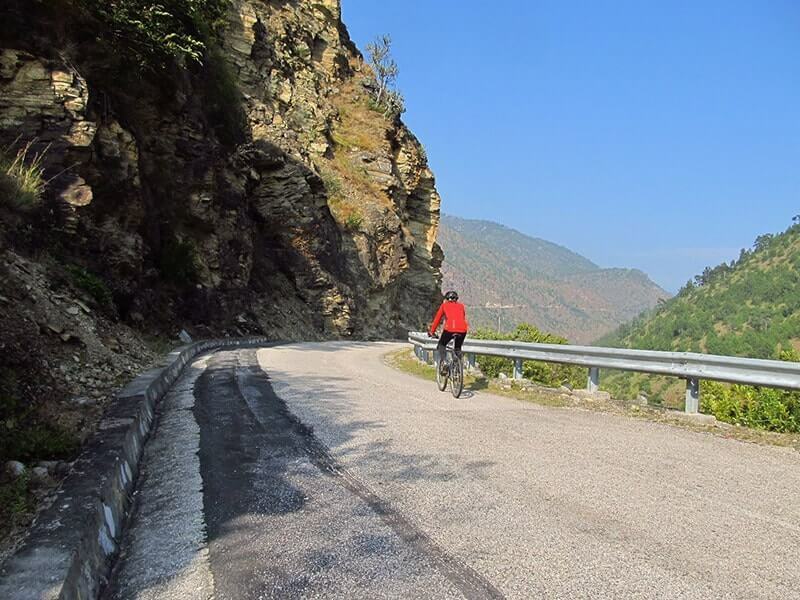 Along the way, we will find a suitable wayside spot for a lunch stop and then continue riding via a narrow gorge through to the widening valley of Namseling which can be considered is the southern of Thimphu Valley. Along the main road, you will see small house and shop. While cycling, you are welcomed by the friendly smiles of local children. Just before reaching Thimphu, we cycle to visit Simtokha Dzong, one of oldest Dzong in Thimphu that was built in the year 1629 by Zhabdrung Ngawang Namgyal, who unified Bhutan. Then we continue ride down to your hotel in Thimphu downtown. Overnight in one of the carefully-selected hotels in Thimphu. 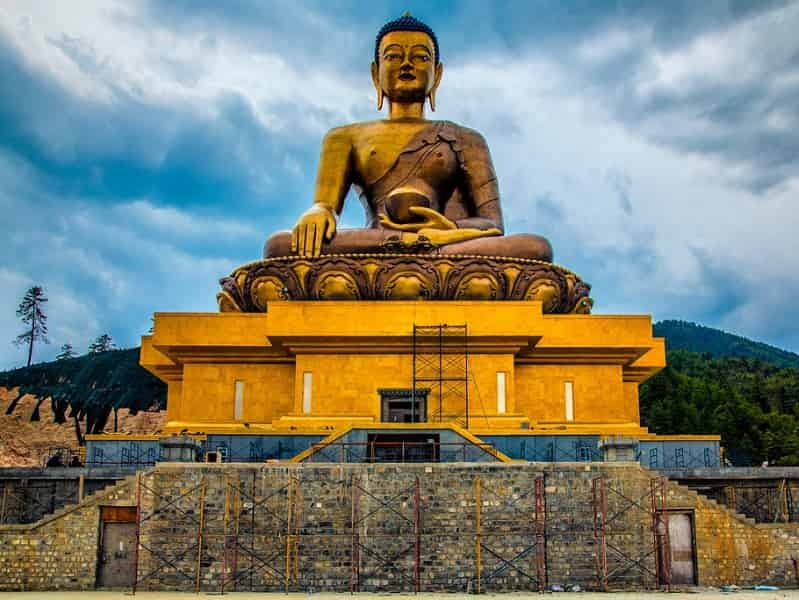 Once a rustic village sitting in a broad, fertile river valley, Thimphu is today the nation’s most modern city and the main center of commerce, religion and government. Enjoy a full day of sightseeing including a visit to the National Memorial Chorten, one of Thimphu's most iconic monuments. It was built in 1974 as a memorial to the third king, Jigme Dorji Wangchuck who reigned from 1952-1972. After that, we will visit Thimphu Institute of Zorig Chusum where you can catch a glimpse of apprentices honing their skills and knowledge in 13 traditional arts and crafts of Bhutan, Folk Heritage Museum Kawajangsa which is providing a detailed insight of the entire folk history and heritage of Bhutan. We also take a visit to Bhutan National Library where is housing Bhutan traditional books and historic manuscripts dating back to the 8th century. In the afternoon, we will visit Motithang Takin Preserve to see takins, the national animal of Bhutan. Then take a visit to the majestic Tashichho Dzong which is located close to Thimphu town, next to the banks of the Wangchhu River. It was built in 1641 by Zhabdrung Ngawang Namgyel and was reconstructed several times over the years. Now, it houses the secretariat building, the throne room and the office of the king, and the central monk body. Later, we visit the traditional handmade paper factory where they produce paper manually from the bark of the plant called Daphne. NOTE: If your visit to Thimphu coincides with the weekend, we could take a walk through Centenary Farmers Market which is the main source of fresh produce for Thimphu city. Farmers come from all over the country to sell their farm products (vegetables from farms and wild ones collected from forests, fruits, etc) and livestock products (mainly cheese and butter). In addition, we also could visit many stalls which sell Bhutanese handicrafts and household items. After breakfast, start our full day cycling to Punakha, one of former capitals of Bhutan. 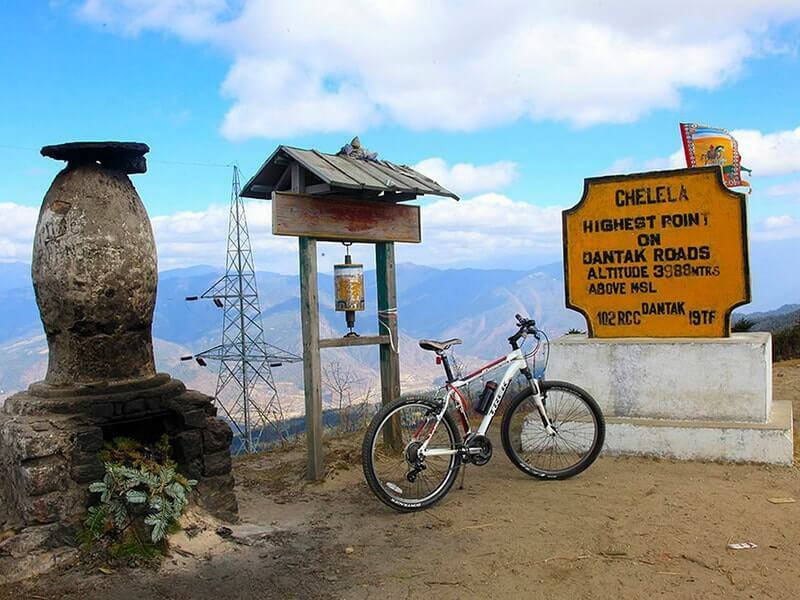 The first challenging of journey is a climb up of 22km ride and a height gain of 670m up to Dochu La Pass (3,100 meters). Our support vehicle will be on hand at all times whenever you need assistance. The hillsides on either side of road are covered in a luxuriant temperate forest of rhododendron and magnolia. If we are lucky, we could see monkeys, deer and other animals which are living in the forest. 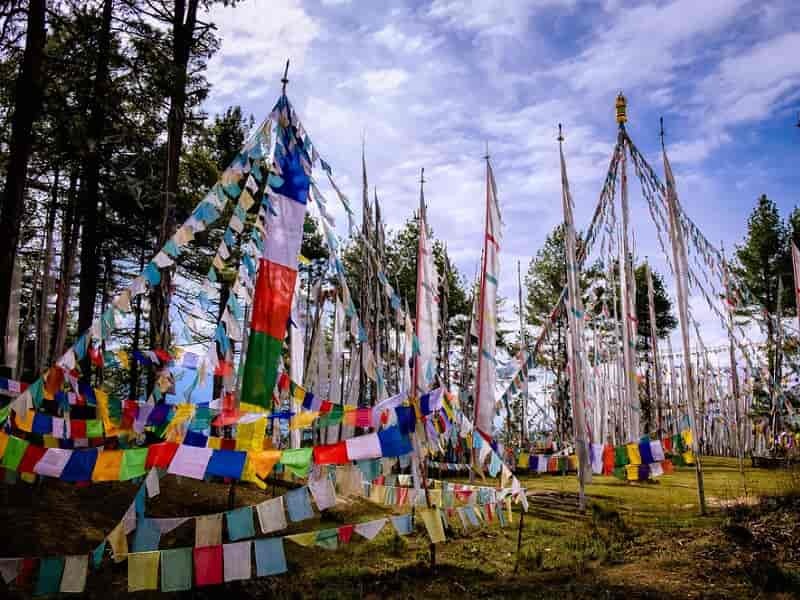 Upon arrival Dochula Pass, stop to take a good break and explore the memorial 108 chortens were constructed as a memorial built by the queen, Her Majesty Ashi Dorji Wangmo Wangchuk, to honor Jigme Singye Wangchuck king. Have your lunch at Dochula café while enjoying spectacular view of the Himalayas range on a clear day. For remain 50 kilometres from Dochu La Pass to Punakha, you will barely have to pedal as the road is downhill. Along the way, we ride through orange, banana, rice plantations. On arrival Punakha, we will cycle to visit Punakha Dzong which is arguably the most beautiful dzong in the country. It is situated at the confluence of the Mo Chu and Pho Chu (Mother and Father Rivers). After that, we head to your hotel for check in and take refreshment. This morning, cycle through the lush Punakha village towards Chimi Lhakhang, a pilgrimage site for childless couples. We will stop at Sopsokha Village roadside and take a stroll (about 20 minutes) through the rice fields before reaching the monastery. People believe that childless couples will have children if they get blessing from the lhakhang's wooden phallus. Thereafter, we continually ride to Wangdue Phodrang, explore the bustling morning market of town. The road from Wangdue to Gangtey would be the greatest cycling challenge in this trip, as in a 55km long road, we have to gain almost 2000 meters into the Black Mountains. So prepare yourself mentally and physically to take on this challenge! For those who find the going tough, our support vehicle will be on hand to take the strain. On the way, we will cycle through lovely terraced fields, thick oak and rhododendron forest and cross the highest point at Lawala Pass (3300m). Just before crossing the Pele La Pass, a small side road splinters off to the hidden Gangtey Valley. Gantey is one name of the area of the Phobjikha, a glacial valley and winter home of black necked cranes (November – March) migrating from the Tibetan plateau. Start the day by cycling to Gangtey Goemba, an important monastery of Nyingma school of Buddhism. From this monastery, enjoy the valley's prime real estate, on a forested hill overlooking the green expanse of the entire Phobjikha valley. Afterwards, we depart from this beautiful valley, head eastwards once again, continuing our climb to Lawala Pass (3300m) and Pele La Pass (3390m) which divide western and central Bhutan. Here, you could see the beautiful mountain of Jomolhari (7326m) if the weather permits. From the pass, we will ride down almost all the way for 60 kilometers to Trongsa. Have your lunch near the magnificent chorten of Chendebji which was built by Lama Zhida, to cover the remains of an evil spirit of a gigantic snake that was subdued at this spot. After lunch, we ride follow a dramatic section of the road, carved into the side of a cliff, high above the Mangde Chhu to enter the beautiful Trongsa valley. If we have time in the afternoon we will take a look around Trongsa Dzong, an important administrative building, providing the headquarters of the government of Trongsa District. It is considered one of the most spectacularly sited Dzong in Bhutan, with a sheer drop to the south that often just disappears into cloud and mist. NOTE: Due to the regular road blocks and landslides between Trongsa and Bumthang, Asia Senses Travel will not be conducting tours to Bumthang in June, 2019. 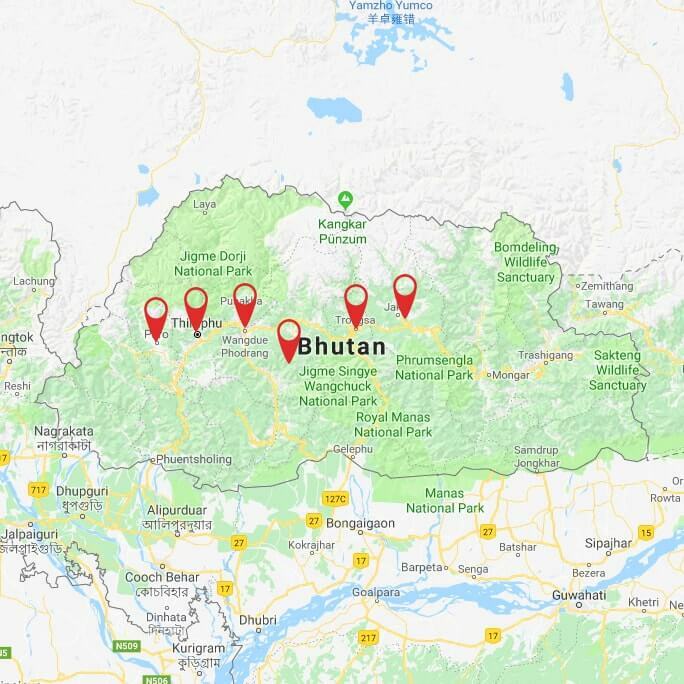 Today, we will drive through Bumthang (Jakar valley), one of the most spectacular valleys in Bhutan and also the spiritual heartland of the kingdom. Setting out of Trongsa the climbing starts immediately as the road zigzags its way up into the mountains. After a 30 km mountain road with spectacular scenery, we will reach Yotongla Pass (3400m). From here ride down through a dense, beautiful coniferous forest to a wide, cultivated valley known as Chumey Valley, home to Bhutan’s famous Yathra weaving. Visit a village in Chumey, observe ladies weaving yathras. You may be able to see the dyeing of wool using natural dyes and other processes. Afterwards, continue our ride to the town of Bumthang. Check in your hotel then free to explore this beautiful town. Time to celebrate with a locally produced Red Panda Beer, Bhutanese whiskey, or for the non-drinkers locally made organic apple juice. Start our cycling tour with a visit to Jakar Dzong, literally meaning “castle of the white bird” is located on picturesque location overlooking the Chokhor valley. Its official name is Yuelay Namgyal Dzong, in honour of the victory over the troops of Tibetan ruler Phuntsho Namgyal. Our next destination is Jambay Lhakhang which is said to be one of the 108 temples built by the Tibetan King Songtsen Goenpo in 659 AD. Then we take a visit to the grand Kurjey Lhakhang, considered one of Bhutan’s most auspicious monuments. This temple built around a cave with a body print of Guru Rinpoche imbedded in the wall. The great Guru also created a holy water hole beside the temple which people frequent either for religious or medical purposes. Then we visit Tamshing Monastery before heading back into town and exploring the valley’s unique cottage industries: Red Panda Brewery, Bumthang Cheese/Dairy Facility and Bumthang Distillery, brewers of numerous distinctive spirits. In the late afternoon, we ride to visit the extensive Wangdicholing Palace which is built in 1857. The palace served as the principal summer residence of the first and second kings of Bhutan. After breakfast, load up the support van and start the long drive back over all those passes you climbed in our journey by now. Our drive to Wangdue Phodrang will takes almost of the day. Upon arrival, check in hotel for refreshment. Our Bhutan Cycling Tour: A Journey from West to East wraps up today. Free at leisure until our guide and driver transfer you to Paro airport for your onward destination. End our services.